Rainbow hair is all the rage these days. Of course, ladies have always loved prancing around like unicorns, but these days even dudes have joined in the fun. If you’re looking to rainbow, though, you need to do it right. Here are a few steps to think through first. If you’re a brunette, however, you’ll need to take a bit more care in the dying process. Bleaching your hair light enough to accommodate rainbow dyes (especially if you opt for the pastel version) takes a long time, and can damage your hair quite a bit. 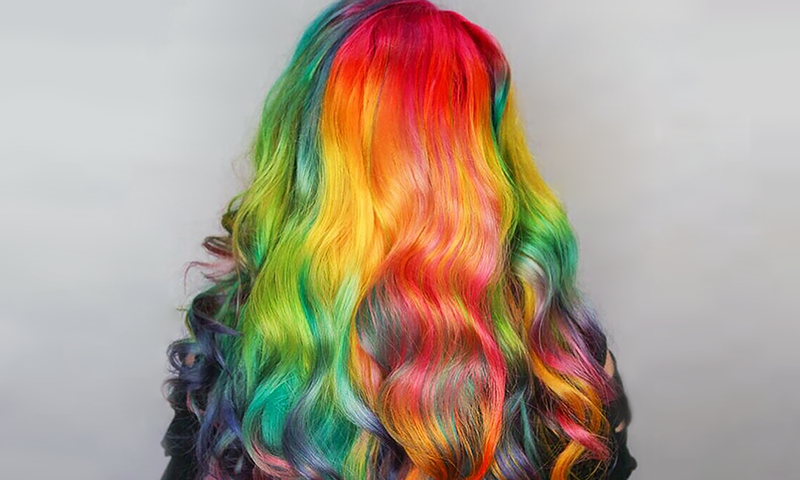 You have two options: 1) Maintain your ‘do carefully with salon conditioning treatments, or 2) Rainbow the bottom half of your hair only, so that as ends dry out and frizz, you can routinely cut them off. You can also choose gem tones as opposed to pastels, which require less bleach, but they do still require lightening and can damage hair. No one wants to sit for a consultation when what they really want is instantly amazing hair. However, most professional stylists will insist on doing one before diving in, as it’s a crucial step in forging that meeting of the minds. Will you be getting your rainbow in vertical or horizontal bands? Ends only or whole head? Highlights or total color? These are all important questions to answer beforehand, so don’t skip the step. Bleach can be a bit scary, especially if you have dark hair you want to protect. If you’re happy with an ombre effect, why not simply put in rainbow extensions? They give you a fun and upbeat effect, all without harming one strand of hair on your head. They aren’t much more expensive than a full color either, so ask your stylist about where to procure them and how much it will cost to dye them and integrate with your hair. Have more questions about the multicolored approach? Get in touch with a stylist today to make a plan. That way, you’ll have the best products, the best training and the best advice, all at your fingertips. Get ready to rainbow!